When our USk Chicago group was recently at the Chicago Cultural Center, many of us were entertained by the very talented Irina Feoktistova as part of the Sunday Salon Concert Series. While I was only about 15 yards away facing the opposite direction from the performance, my ears enjoyed the performance (to say the least). It turns out that my mother-in-law is a wonderfully talented pianist who has played so long that many of the songs in her repertoire she has memorized. My piano--which normally collects way too much dust these days since my son has switched to the electronic synthesizer--comes to life whenever Juliet is in the house. Preparing the final details on a Thanksgiving meal are so much more enjoyable when Juliet is filling the house with her music. 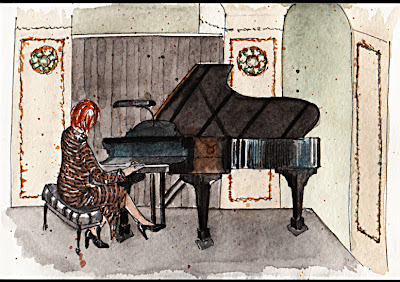 I was already sitting at a great angle sketching the grand piano in the Music room when two ladies arrived chatting in Russian and walked to the piano. One sat down and proceeded to play a piece of Tchaikovsky intoning it in a familiar Russian manner. That was just a warm up, the concert would actually start later. 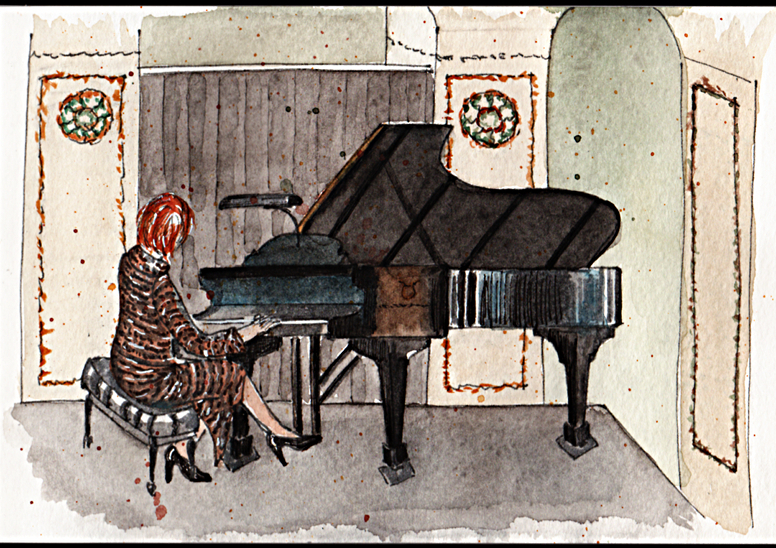 The piano in my sketch was nearly complete so I just sat the lady pianist in front of it, tiger striped outfit and all. I was sitting there sketching, listening to Tchaikovsky and thinking that life rarely gets better than this: beautiful room, Tiffany glass, wonderful live music, five old and new friends around me, a pen and a sketchbook. Cheers! 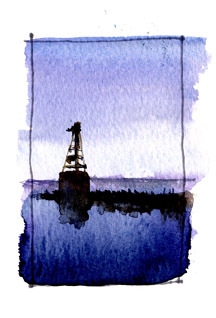 Chicago suburbs: Sometimes the act of urban sketching puts the artist in a real life situation where it is tough to decide when to jump in and help and when to capture the event. The action may happen so fast that the only way to capture the event is by taking a photograph or to have the scene so clearly etched in the mind (such as this one). This sketch was created in 1977 when I used to live on a busy street in the suburbs, at the bottom of a hill where drivers often stop and turn into the subdivision. Often I would hear screeching of tires, slamming on the brakes, and the more rare collisions. This accident was captured after all of the first responders had arrived and the situation was under the control of the incident commander. I became one of the many witnesses standing across the street to see how the rescue mission would play out and I could then focus on contrast of shapes and the lighting for the nighttime event. Sometimes what the urban sketcher captures may be useful to the police because our observational skills can help piece together the puzzle. 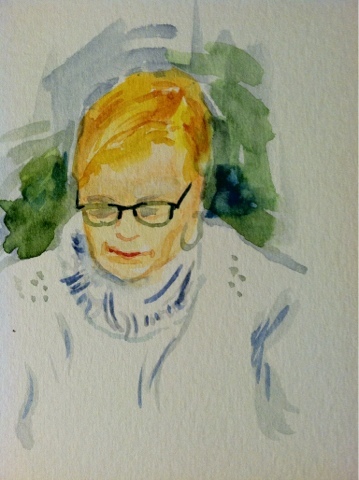 So many Urban Sketchers capture their cities in the architecture but for me it's the people. There's nothing like people-watching in the city. It gets my creative juices flowing! So many stories, each unique and yet somehow universal. the rink at Millennium Park. Despite the cold it was filled with skaters. There were tourists and locals, novices and pros, kids and the forever youngs and of course the speedsters. HA! When you're trying to sketch them they're all speedsters! After sketching at the rink for I while I went back to the Center to meet up with the others and to finish up the color on my sketches. What a great group! It was a fun day! On my way home from the Chicago Cultural Center "Let's Sketch" event on January 20th, I chilled out in the food court of the Ogilvy Transportation Center. I spotted this poor guy. So tired was he that he didn't even know he was laying down on his take out container. I've been there so I felt for him. And I wondered if the two people in the background had noticed him or if they were snapping pictures. Sketched in pencil, then traced in Uniball MicroVision pen. While I most often work in colored markers and pencils, this sketch I scanned and bought into my iPad and colorized it in iBis PaintX. Pretty cool program and I expect to bring it to more "Let's Sketch" events. 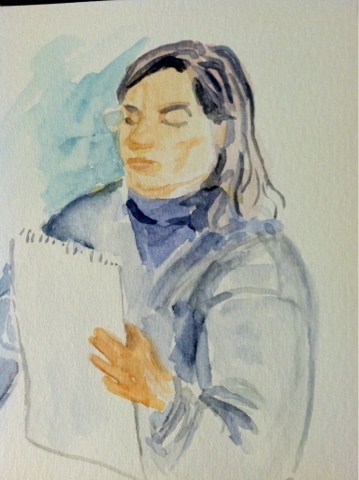 The January Urban Sketchers meet turned out a spectacular event. An unprecedented number of artists showed up. It felt like there were 30 of us, or perhaps it was only 20 and I am exaggerating in my excitement. I really could not count us all, there literally was at least one Urban Sketcher in every room, and the Cultural Center is a very large building. One of our sketchers - Lucas - invited two of his classmates from American Academy of Arts and his painting teacher! It also felt that perhaps the movement is finally making traction in Chicago and beginning to gain momentum. The internal architecture of the building is so beautiful that it is very hard to settle down and select something one to draw. I knew I had to limit myself to something manageable. I sketched in the Cultural Center before and was aware how easy it is to be enchanted by its beauty and try to grab too much for a given amount of time. So I chose a window, just one window, looking south on Washington Ave. But let’s back up about a month. 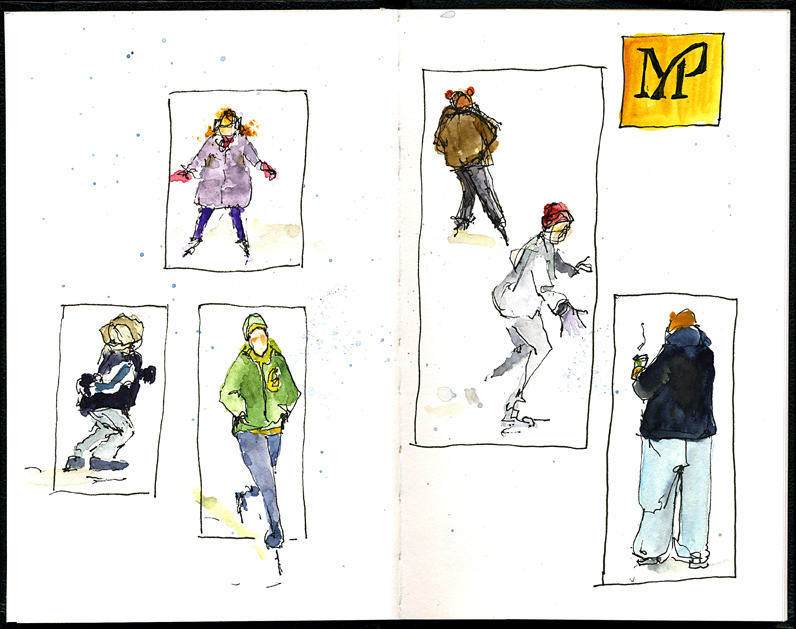 How did I come to walking 10 blocks in 15º F cold to join up with Urban Sketchers Chicago? In December 2012, I walked over to the Elmhurst Public Library from my office to check out the new book section (as was the habit of mine during my lunch breaks). The library is only a block away so it was good exercise. Scanning the creative book section, I stumbled upon a book called “The Art of Urban Sketching." By now, many people are very familiar with it but at the time this book was new to me. I come across books on sketching all the time and I even seek them out. But this book caught my attention and realized that I was learning a new term, "urban sketching." With the background noise of a woman on her laptop hammering on her keyboard as if she was a percussionist in a rock band (sketch shown on the left), I flipped through the sketches from various artists and learned about the existence of the global community. Then I went to the website and noodled around there until I noticed that off to the right were local chapters listed. I clicked on the link for "Urban Sketchers Chicago" and found the Facebook group page. Then I asked to "join." Only a few days later did I receive notice that I had been accepted into the group. I do not recall if Alex Zonis herself had responded to me but she was and has always been the face that I recognized from my first encounter with the group. Since I had been sketching most all of my life, sketching scenes from my life were already embedded into my daily habits. I merely continued sketching random scenes that appealed to me but with a new focus on paying attention to only those scenes that were directly in front of me. 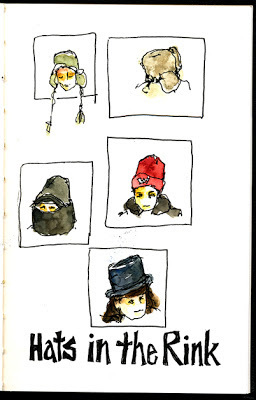 And I became a prolific poster of my sketches to the USK Facebook group. Then I found out that this Chicago chapter meets once a month at various locations around the Chicagoland area and the next one was scheduled for the Chicago Cultural Center on Michigan Avenue. "What? You mean I can actually meet real, live people from a Facebook group? Does that even happen?" As a matter of fact it does happen and it continues to happen for urban sketchers every year, every day. Now back to that bitter cold day in January. I walked around the Chicago Cultural Center and noticed the sketchers that Alex had told me about – some in clusters sketching together and some by themselves, alone in a corner. All of them were busy sketching and little to no conversation took place. I think I had envisioned that these get togethers were going to be like workshops where artists were collaborating, laughing, having fun and enjoying each others' company. But then I had to remind myself that these were artists and artists tend to be quiet, focused people who, like me, have trouble sketching and talking at the same time. And I was ok with that. At the end, when all of the urban sketchers were invited to meet back at one of the entrances to share what they had sketched, it was then that I realized the magic of this group. I was able to see how many people had shown up and braved the cold on this God-forsakenly cold day in order to do what they enjoyed best with other like-minded individuals. And to have the ability to see such a range of talent and working styles opened my eyes to the true benefits of being a part of such a wonderful community. And to top of this already wonderful experience, Alex Zonis and Mary Lanigan Russo had asked me to consider being a correspondent of this group. 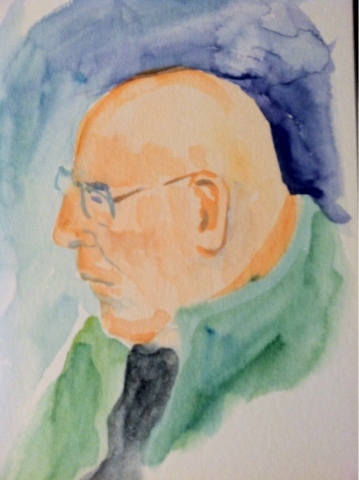 This essentially allowed me to be a regular contributor to this USK Blog. I thought it would be fun. The rest, as they say, is history. We went to see The Hobbit: An Unexpected Journey at Navy Pier yesterday. This thumbnail records a Wow moment for me. The color, the light and the shadows looked just like the temperature felt…Brrr.